Moscow’s Sheremetyevo International Airport saw its passenger traffic grow 9.2% in the first three months of 2016 (all comparisons year-on-year), to 6.9 million passengers. Domodedovo served 0.2% more passengers over the same period, or 5.7 million passengers, while the number of passengers at Vnukovo plummeted 25.4% to 2.2 million. All three airports demonstrated a growth in domestic passenger numbers: 3.2 million (up 15.2%) for Sheremetyevo, 3.5 million (up 13%) for Domodedovo, and 1.8 million (3.9%) for Vnukovo. Their international traffic, however, showed a somewhat different situation: Sheremetyevo saw a 4.6% increase to 3.8 million, whereas Domodedovo reported a 15.7% drop to 2.2 million. Vnukovo registered the most dramatic shrinkage in numbers, down 67.0% to 407,900 international passengers. This lamentable international performance at Vnukovo, which used to lead the three airports in this field, is due partially to the 2015 folding of Russia’s second-largest carrier Transaero, for whom the airport was the Moscow’s primary gateway. The Vnukovo management hopes that Aeroflot’s newly formed subsidiary Rossiya, which is planning to launch operations from the airport this spring, will help turn the tabs. 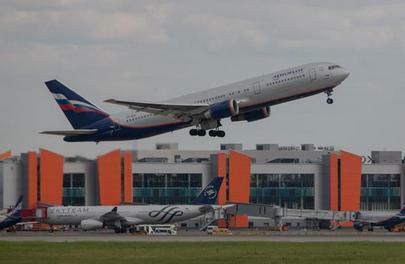 Rossiya was recently created by merging its erstwhile namesake with Donavia and OrenAir. The new airline is expected to fit nearly into the Transaero niche in terms of passenger traffic. Overall passenger growth at the three major Moscow airports was offset by the continuing decline in passengers carried by Russian airlines. The Russian Association of Air Transport Operators reports that domestic carriers served 16.3 passengers in Q1, or 3.0% down year-on-year. The other Russian airports which have made their Q1 statistics available to date demonstrated the following traffic results: Koltsovo (Yekaterinburg), up 4.9% to 778,000; Kurumoch (Samara), up 1.5% to 420,500; Yemelyanovo (Krasnoyarsk), down 5.0% to 331,700; Strigino (Nizhny Novgorod), down 11.4% to 140,000; Rostov-on-Don, down 1.6% to 399,200.